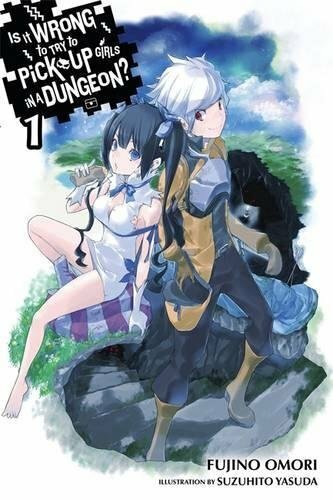 Popular light novel series Is It Wrong to Try to Pick Up Girls in a Dungeon? is often mistaken for belonging to the isekai genre. In reality, these books are fantasy, set in a world where gods rule over ‘families’ and the children who belong to them, adventurers, explore the seemingly endless dungeon under the city of Orario. You’d think that all DanMachi (as we’ll refer to it now) would have going for it is the tales of exploring the dungeon, but actually author Fujino Omori keeps the story twisting and turning in unexpected directions. Today I’d like to talk about Omori and his talent for weaving such a compelling narrative. Besides the main light novel series, DanMachi also has two spin-off series, two seasons of anime, two manga and a film under its belt. With that accounted for, I think it’s safe to say that the DanMachi universe is huge and, surprisingly, Omori handles a lot of it himself. Usually, when spin-offs are created in a franchise they’re overseen by the original creator, but not necessarily written (or drawn in the case of a manga) by them. However, in this case, Omori writes the main series as well as the Sword Oratoria and Familia Chronicle spin-off novels. He also wrote the script for the movie, Arrow of the Orion. It’s certainly a lot to juggle both in terms of the general output and keeping the story interesting but Omori rises to the challenge well. “I think I may not have had enough of this ‘resolve’ before. I’m not discounting the promise I made to my grandfather to try to pick up girls in the Dungeon. Still, I was caught up in the first volume of a colourful hero’s tale. I wanted to become a character in one of those flashy stories. 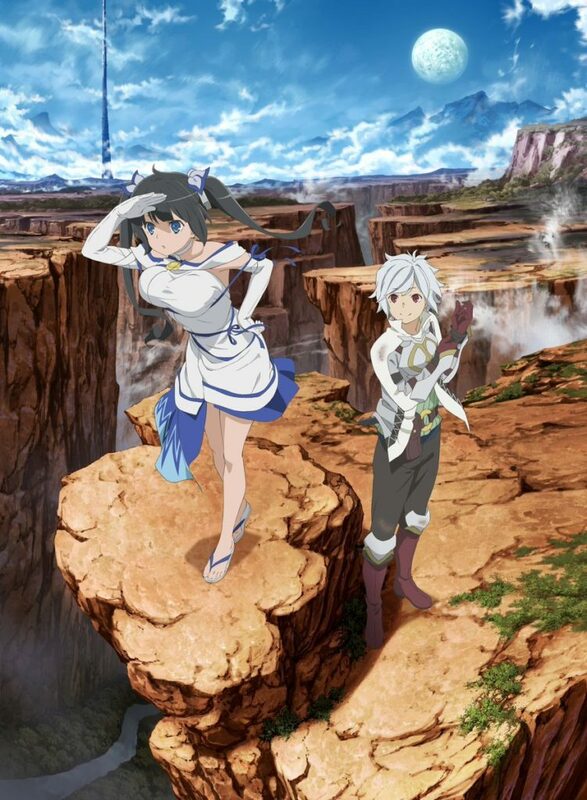 In the main DanMachi series, we follow the young adventurer, Bell, who belongs to Hestia Familia and is a newcomer to the hardships of the dungeon. Through the course of the thirteen volumes so far, we’ve watched Bell as he rises up from a novice to someone to whom we can comfortably give the title ‘hero’. With friends and strong comrades at his side, he’s grown a lot. Bell’s adventures follow the path of the traditional hero’s journey perfectly and many would level that as a criticism of Omori’s writing, but actually, it’s a strength. To take an idea so traditional and fill it with characters and grand challenges that catch you off-guard is a talent in its own right. Meanwhile, with side-story series Sword Oratoria, we follow the adventures of Loki Familia which is home to Bell’s idol Aiz. The Familia is considered one of the best in Orario and seeing the world through the eyes of Aiz and her group is very different to that of Bell. It’s a chance for Omori to up the stakes and offers the kind of frantic, impossible situations that Bell isn’t strong enough to face. However, above all, Sword Oratoria explores the world of DanMachi more than the main series ever can. With so many more characters and backgrounds, Sword Oratoria answers a lot of unanswered questions and is genuinely a great addition to the universe. The fact that it runs concurrently alongside the main series means we get to see Bell’s adventures from the perspective of other adventurers too, which is often fascinating in its own right. I mentioned above that Omori writes three DanMachi series currently and the third of those is Familia Chronicle. This one is only a single volume so far, but Omori has noted in the afterword that he created the series to give himself the opportunity to tell stories about characters we don’t otherwise see much of. For example, the series’ first volume focused on Lyu – the mysterious elf adventurer Bell is friends with. 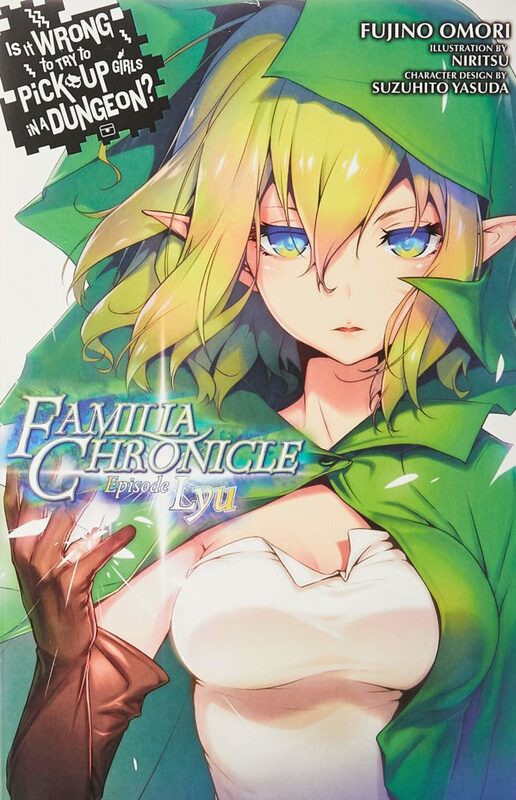 Familia Chronicle is yet another angle from which to view the overall universe, but one with short stories in mind rather than an on-going plot, which differentiates it from Sword Oratoria. As an avid light novel reader, I can say that most series I follow for 13+ volumes are usually stale by now. Even if they’re not stale then they’ve lapsed into a routine in how the stories are told and what happens. This is especially true of the fantasy/isekai genre where the goals of the story are often fuzzier than in other series, but somehow DanMachi manages to avoid this trap. ““Vows are broken again and again. I’m sure there’s not a vow in the world that hasn’t been broken. But some people are bad at giving up, and those people bring their vows back to life time and again. Despite the end goal being Bell exploring the dungeon and becoming stronger, this series always has something new up its sleeve. The first five volumes are largely set in the dungeon, but since then we’ve seen things shaken up. With plenty of stories to be told aboveground, Omori began to split our time between it and the dungeon. It’s not just where the stories are told that differs, though, as the author also strives to present Bell (and Loki Familia) with different kinds of adventures. From expeditions, hunting down rogue Familia, standard monster slaying, all the way through to war games and love stories – DanMachi has it all. Of course, none of this would hold together without good writing and Omori has that in his favour too. The later entries in this series read differently to its humble beginnings. Omori has started to make more use of third-person perspectives and often switches between his characters over the course of a book. It’s not that the first few books are poorly written, but that the style of writing has evolved. Omori can be overzealous with details when describing everyday scenes, but he always pulls it back for the fight scenes – leaving only what’s necessary. It’s great as a longtime reader to see how far he’s come and exciting to guess where he’ll be in another thirteen volumes. “Can’t stop, won’t stop, can’t give ground. Blood-splattered silver sword met horn; sparks flew. Bell spun and struck again. Everyone watching the battle taking place on the lower-ninth floor of the Dungeon knew the end was near.” – DanMachi Volume 3, Bell vs. the Minotaur. Honestly speaking, fight scenes in DanMachi are some of my favourites among any of the light novels I’m reading currently or have read. They’re easy to follow and exciting, but most importantly I can picture them clearly, as well as the feelings of the characters. Our heroes are powerful but always at the mercy of the dungeon; one wrong move could spell their death. I think Omori does a good job at building up their confidence and then crumbling it to remind both them and us that they’re never invincible, no matter how powerful they become. “The two charged and collided, going blow for blow, one step forward, one step back. Neither showed signs of slowing down. The Minotaur threw an off-balance kick toward Bell’s face, but was blocked by the sword. Bell used the sword to swing himself up and land a punch just beneath the Minotaur’s eye. The impact cracked bones in his hand, but he flew past the Minotaur, landing just behind him.” – DanMachi Volume 3, Bell vs. the Minotaur. 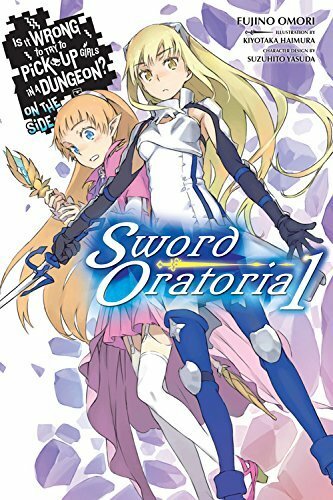 In fact, Omori’s writing is so good that even when he wrote himself into a corner with Volume 7 of Sword Oratoria, he still made an entertaining story out of it. In the afterword for the volume, Omori admits that he had to throw out his original plan for the story after realising the inconsistencies it had with the main series. Worse still, he wrote out the characters who could bring the story to its conclusion and left himself with those ill-suited to the situation. With the deadline looming, Omori threw it all aside and had those characters overcome the challenge anyway, in what can only be described as a fight of sheer bloody-mindedness. Admittedly the end does come across as forced, but it was fun to read and in the end, I think that’s what matters most. The fact Omori even admitted to the troubles he’d had was surprising and enlightening, making it easy to forgive one overpowered battle. What got me thinking about all this was when I was reading Volume 13 of DanMachi recently. I was so engrossed in the story and the life-or-death situation, that I ended up reading almost the whole volume in one sitting. It was impossible to put down and I realised very few series have that hold over me consistently. I often wonder if it’s just because I am fond of Bell and his Familia, but then I realise that Sword Oratoria and Familia Chronicle are the same. The end result is simply that Omori has created an incredible world but also balances it impeccably, never letting it become dull or repetitive like so many other series. As a fan of DanMachi and its various spin-offs, I can’t wait to see where the story goes in the future with its unpredictability. However, as a fan of Fujino Omori, I’m looking forward to seeing how he grows as a writer and what he accomplishes in the future. I’d love to see him tackle a new world and cast, maybe once he finishes up some of the spin-off series he (and we) love so much! This time last year J-Novel Club quietly launched. The service brought a new way for us to legally consume light novels in the West and now with the service celebrating its first birthday what better time to take a look at how far they’ve come!